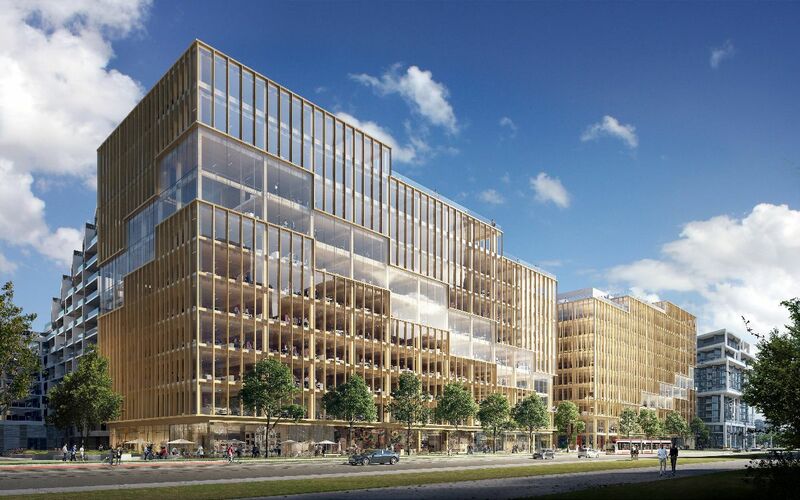 International real estate firm Hines has announced plans for T3 Bayside, the first office building in Toronto’s emerging Bayside community, located on the shores of Lake Ontario. Designed by the Danish architecture firm 3XN with architect of record WZMH, the 10-story structure will stand at 42 meters high. If it were built today, it would be the tallest timber office building not only in Toronto but in all of North America. 3XN was selected by Hines to design an office space as part of the 2,000-acre revitalization initiative that will transform Toronto’s waterfront. T3 Bayside will join 3XN’s two residential buildings in the area, Aqualuna and Aquabella. The new building and adjoining plaza will serve as a dynamic visual and pedestrian gateway to the entire neighborhood, connecting residents and visitors to the revitalized waterfront. T3 Bayside is designed to reflect the emerging neighborhood in which it sits. The building creates a continuously activated ground level, with abundant retail opportunities on all sides. At the base of the building, a new central plaza has been created, around which are additional community and shared spaces, including exhibition and gallery spaces, flexible office space and co-working facilities. The use of timber contributes to the sustainability of the building and reduces construction time. The wooden structure will be built in Cross Laminated Timber. The materiality of timber defines the interior aesthetics and will also be reflected in the exterior of the building. The use of wood—a breathable and absorbent material that allows the release of moisture—ensures a naturally regulated and healthy indoor environment.